Franz Vincenz Krommer, violinist, organist and composer, was born on November 27, 1759 in Kamenice u Trebíce, Czechoslovakia and died on January 8, 1831 in Vienna, Austria. Krommer’s name is also often seen as “Krommer-Kramar” because his actual name was Frantisek Vincenc Kramar. His first musical training, age 14 to 17, was studying violin and organ with his uncle, composer and choirmaster, Anton Matthias Krommer. He moved to Vienna in 1785, then from 1786 held various posts in Hungary, before returning in 1895. From September 13, 1818 until his death, Krommer was the last official director of Chamber Music and court composer for the Habsburg Emperors. Krommer wrote over 300 compositions but only began publishing in his later years. Along with Franz Joseph Haydn (1732-1809), Krommer was regarded as a leading composer of String Quartets and a serious rival to Ludwig van Beethoven (1770-1827). His solo Wind Concertos - one for Solo Clarinet (op. 36 in 1803); also, two for 2 Clarinets (op. 35 in 1802 and op. 91 in 1815); two for Flute (op. 30 in 1802 and op. 86 - also arranged as a Clarinet concerto); and two for Oboe (op. 37 in 1803 and op. 52 in 1805 - also arranged as a Clarinet concerto) - are now considered his most individual accomplishments, following the Classical Music Period (1750-1825) style of Haydn and Mozart. In his capacity as Director of Chamber Music, Krommer wrote a very large quantity of Chamber Music, including: 26 String Quintets (for 2 violins, 2 violas & cello); 83 String Quartets (for 2 violins, viola & cello); 9 Flute Quartets (for flute, violin, viola & cello: op. 13 in 1798, op. 17 in 1799, op. 59, op. 75 in 1808, op. 89 in 1820, op. 90 in 1820, op. 93 in 1820, op. 94 in 1820 and op. 97); 2 Bassoon Quartets (for bassoon, 2 violas & cello, op. 46 in 1804); and 2 Piano Quartets (for piano & strings, op. 95 in 1817). Of most interest to us, of course, are the Chamber works for the Clarinet: 13 Pieces for two Clarinets and Viola (op. 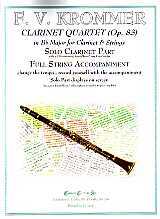 47, 1804); a Clarinet Quintet (for clarinet, violin, 2 violas & cello, op. 95); and 5 Clarinet Quartets (for clarinet, violin, viola & cello: two as op. 21 in 1802, op. 69, op. 82 in 1816 and op. 83). It can be observed that Krommer was not very careful with his use of opus numbers; there are two totally different works for each of the opus numbers 69, 83 & 95. Full string sounds (“tutti strings”) have been employed in the smp files because of the very inferior sounds for solo string used in SmartMusic since version 9 (the solo string sounds before version 9 were quite good - far less strident). Also included are “X” versions of the smp files, which do employ solo string sounds (i.e., solo violin, viola & cello). - Complete (All four movements). © 2007 Classical Collection Inc.